Most electronic devices have a rating which tells you how effective they really are. 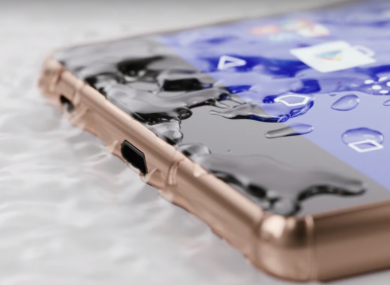 WHEN A MANUFACTURER claims that a phone is water resistant or waterproof, chances are it’s the former. Practically most, if not all, smartphones offer some degree of water resistance, and the quickest way to tell is by checking the International Protection (IP) rating (sometimes called Ingress Protection rating). Included with most electronic devices, not just smartphones, this tells you the level of protection there is against solids – the higher rankings take dust into account – and water. The first digit relates to protection against solid objects while the second digit refers to water protection. For example, the Sony Xperia Z5 comes with an IP65 (if ports are open) and IP68 rating (ports closed), meaning it can resist dust and water to a significant degree, while the upcoming Samsung Galaxy S7, which is expected to be announced today, is said to be waterproof. But all of them follow a scale, the higher the number, the more effective it is at its job. Here’s what the digits mean. 1 – Protected against any large surface (e.g. : back of the hand) but not deliberate contact. 2 – Protected against fingers or similar sized objects. 3 – Protected against thick wires and tools. 4 – Protects against most tiny objects like screws and most wires. 5 – Protects against small amounts of dust entering, but not large quantities. 6 – Dust-tight (complete protection against contact). 1 - Protected against falling droplets. 2 – Protected against dripping water when tilted up to 15°. 3 – Protected against spraying water. 4 – Protected against splashing water. 5 – Protected against water jets. 6 – Protected against powerful water jets. 7 – Can be immersed in water up to one metre. 8 – Can be immersed in water beyond one metre. So the next time you’re looking at a smartphone or device that claims it’s waterproof, you should be able to check its IP rating so you know just how good it is. If there isn’t, you’ll just have to use your better judgement. Email “This is how you can tell whether a smartphone is waterproof or not”. Feedback on “This is how you can tell whether a smartphone is waterproof or not”.